Create an elegant table setting for each of your guest for an afternoon tea. 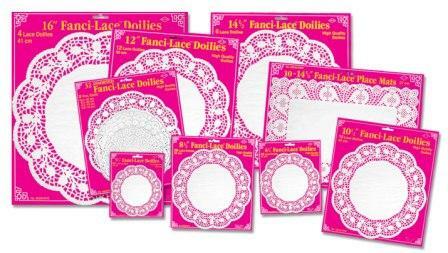 Begin by choosing from the below selection of lace paper doilies, that range in a variety of sizes. Lace paper doilies are beautiful ornamental mats that really make a table look fancy. The paper doilies are the perfect size to set on a saucer before adding an elegant mug. These cheap yet elegant doilies can be used in a variety of different ways to add charm to a table setting. Doilies are also fun to use to make craft projects and homemade greeting cards. The paper doilies come in a variety of different lace patterns that include beautiful flowers and designs. Make decorating for your next event fun and elegant with some help from our line of cheap paper doilies! No matter what kind of doilies you are looking for we’ve got you covered! We’re PartyCheap.com and we know how to party! Lace doilies don't just stop at the table! Yes, doilies are great at tea time, for fancy dinners under centerpieces, but they are also easy to use with for crafts! Make an easy wedding or anniversary decoration by taking a long string of twine rope, some of our cheap doilies and glue. Simply fold the doilies in half and paste on with glue around the rope with the center of the doily glued to the rope. This is a simple, country decoration you can hang anywhere, but would look great strung up at a wedding. 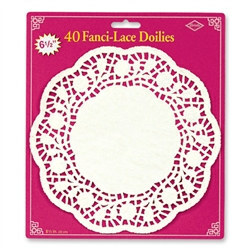 Doilies are also great for vintage themes if you like to make cards or scrapbook. Use doilies under pictures, or layer them on card stock for thank you cards. We’re always interested in hear what our loyal customers have to say! If you have a question or even a great idea for a new product, just give us a call or leave us a message! We’d be happy to hear from you! Next time you’re in need of some cheap paper doilies make sure you party with us right here at PartyCheap.com!